AS220’s Foo Fest—the annual street shindig outside the alternative art space’s building on 115 Empire St. in Providence—is this Saturday, Aug. 18, from 1 p.m. to 1 a.m. It features lots and lots of music (rap to metal to sci-fi synthwave), a parade with fest artist-in-residence Keri King, weaving on a loom, wrestling, art making with the Providence Comics Consortium and The Steel Yard, food and various other vendors. Below is my totally biased guide to what to see at Foo. (My sweetheart Kari Percival and I were Foo Fest artists-in-residence last year.) Tickets are $10 in advance and $15 at the gate. The influential avant garage band, born in Cleveland in 1975, headlines the festival. 2:30 to 3 p.m. FINE. An amazing Providence queercore duo featuring Ly Barber on drums and Iz Dungan on guitar and vocals. 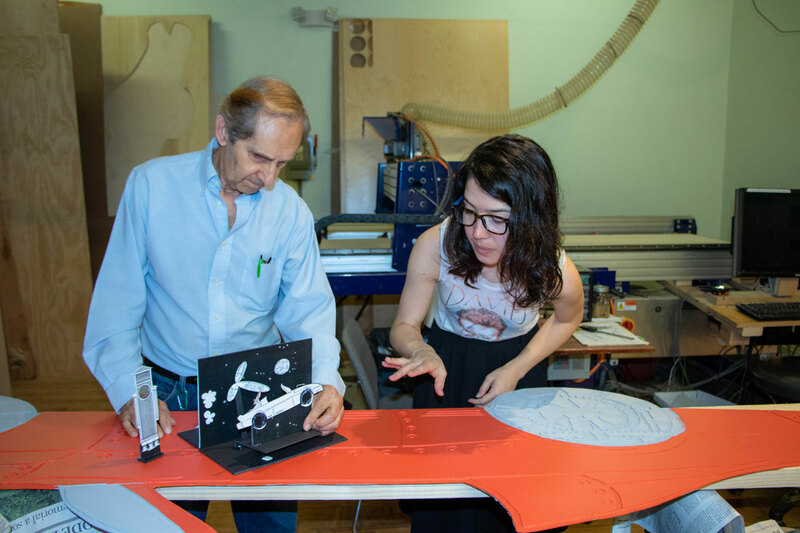 You probably remember Foo Fest Artist-in-Residence Keri King, who resides at AS220, from the pasteup murals of cavorting critters that she created for the 2017 Pawtucket Arts Festival and the 2016 PVDFest. She also recently wrapped up a yearlong creative fellowship at the Providence Public Library. Beginning at 1 p.m. at Foo, King and friend Carmel Dundon will host “Crowns & Costumes” art activities for children and families. Then they’ll gather folks for an “Astronaut Rally” at 4 p.m., immediately followed by a 4:30 p.m. parade featuring art made by the children during the day. New Jersey-born rapper, model and actress (born Rashia Fisher) is well known as a longtime member of the Flipmode Squad, the hip hop squad led by Busta Rhymes, as well as for her solo stylings. The latest offering from Providence’s Joey DeFrancesco, the Downtown Boys guitarist and composer and Malportado Kids producer, is a “bedroom electro pop” (says Allston Pudding) and drag performance decrying decaying working standards, condemning artists who uphold the status-quo, and proclaiming an urgent need for action. The “dark pop super group from Providence” features members from Ravi Shavi, The Low Anthem, Thug Honey, and Sweetpea Pumpkin. Hands-on making activities from the artists (led by Walker Mettling) who, since 2010, have offered free comic book classes for youth at the Providence Community Libraries and published group books and newspapers. 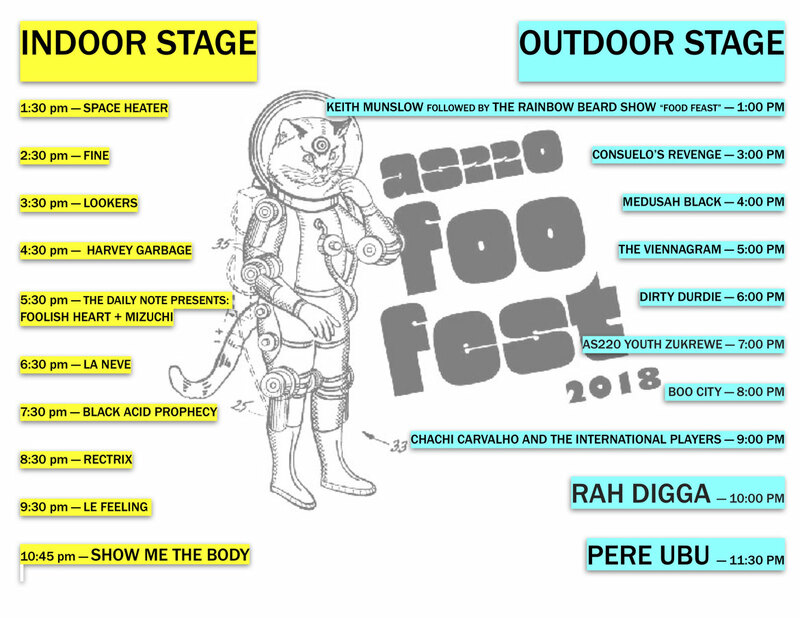 Music schedule for AS220’s 2018 Foo Fest.